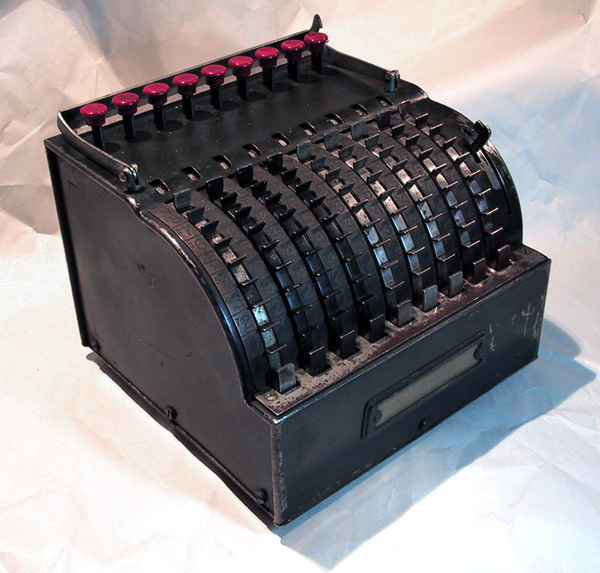 The Todd Protectograph 'Star' adding machine is quite small when compared to a comptometer from the same era, such as the Felt & Tarrant Model J. 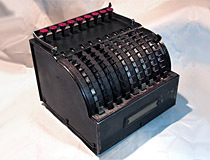 The front of the machine is bristling with ribbed sliders by which numbers are entered into the device. Each rib is labeled with a number mounted to an adjacent plate. To enter a number into the device, the user places their finger onto the appropriate rib and then pulls the slider down until their finger had pushed down the small button at the base of each slider. This is quite analogous to the operation of the digits dial on a rotary telephone. As numbers are entered into the Star, they are are added to the accumulator, which is visible as a series of numbered wheels directly above the data entry wheels. A lever to the right of the display resets the accumulator. The unit also has proper carry suppression controls, for performing subtraction. A second subtraction scale is printed next to each rib; to preform a subtraction the user pulls down the appropriate ribs by using the subtraction scale while holding down the carry suppression button directly to the left of the most significant digit on the accumulator. The unit also has an unusual special feature, a operator lock to prevent unauthorized use of the machine while a calculation was in progress. The lock is in the form of a metal bar that is lowered over the ribbed wheels and locked into place by an internal mechanism. The bar prevents the wheels from being rotated while it is lowered and can only be released by pressing the first carry suppression button. This example dates from the early 1920's; later models of this machine replaced the bar lock with a locking sheet metal lid that covered the wheels entirely. Although multiple sliders could be pulled down at once for fast parallel data entry, the unit will never beat a good Comptometer for speed. Nonetheless, the Star is much faster than ten-key adding machines of the same era. Todd Protectograph Star, serial number 15800. The unit is still fully functional, though stiff when propagating a full carry.